There are times when I will sit on an idea for a little while and chew on it until I realize what I need to say. Lately, this has been happening a lot as I read things on the web, twitter, or hear conversations between friends or at events, especially in regards to the skills and characteristics of what we’ll call the D-side or M-side. @MikeMakai We all have doubts at some point, that’s human nature. It’s what we do in response to those doubts that makes the difference. In the 50 Shades of Reality, aka Real Life that we live in, we’re human. We’re imperfect. I think a dangerous belief for someone who is coming into her or his power is to have this idea that they cannot make a mistake, they cannot have a doubt, or even several doubts and that they have to meet some level of perfection in order to attract a slave or submissive. I remember having those thoughts back when I first started, that I was somehow supposed to jump into the relationship as the model of perfection, all decisions will be without mistake, and I would stride forth like the Dominant-Of-All. It really was confusing and difficult. 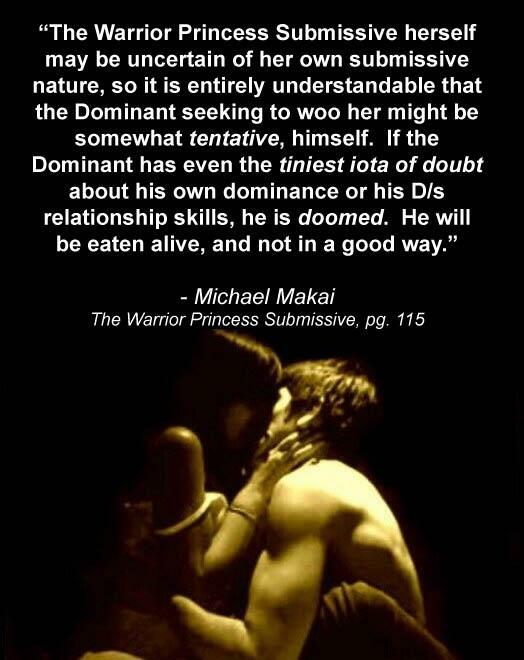 It was even harder when the submissives I met had those same expectations – that if I made a mistake, that if I decided to reverse a decision, if I even communicated doubt to a submissive or slave, it was somehow a marker of my ineptitude as a Dominant or Master. Agreed, 1000%!! I see it so often, over on that KinkyNet place. There are so many over-simplified, insanely romanticized notions floating around out there, that I fully believe doom many relationships to failure, which otherwise may have had excellent potential. John, in one of his leadership roles there, deals with it at alarming rates, daily. Trying to bring people back down to earth, from their ‘bodice-ripper’ romance novels, without completely dashing their hopes is a daunting challenge, in the newbies ring. Reality can be a tough pill to swallow – and many choke on it.